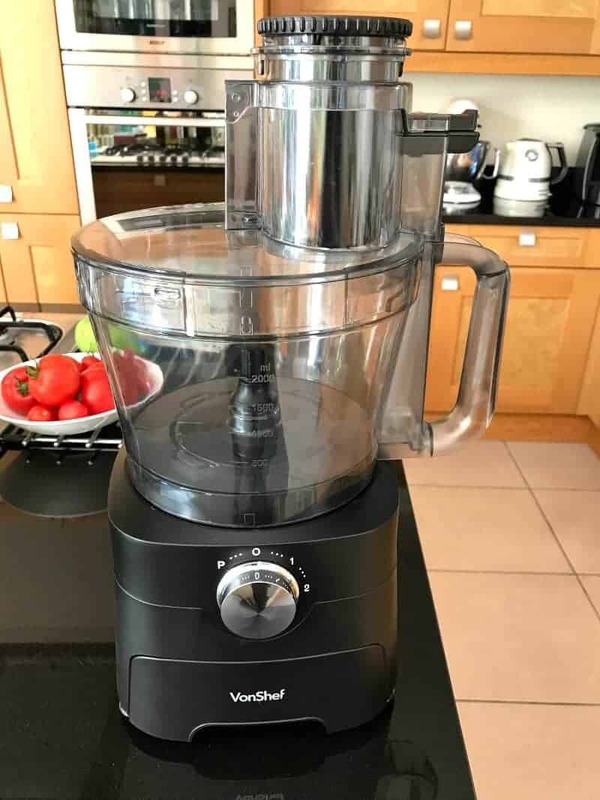 Recently I’ve been trying out a new addition to my kitchen, a VonShef food processor in matte black. I have the 1000 W food processor from the Matte Black Performance range, and very stylish it is too! As you can see here it goes really well with a black granite worktop, and I think being black it will look good in all kitchens without clashing with your colour scheme. With a great design where the blades are stored in a drawer built into the food processor itself, the VonShef food processor doesn’t take up lots of space on the worktop so you can keep it out on the surface so you have it to hand at all times. The main bowl has a capacity of 2 litres and the blender jug of 1.8 litres, so you can happily use it when batch cooking for the whole family. I made a large batch of soup for several days in here with no problem. 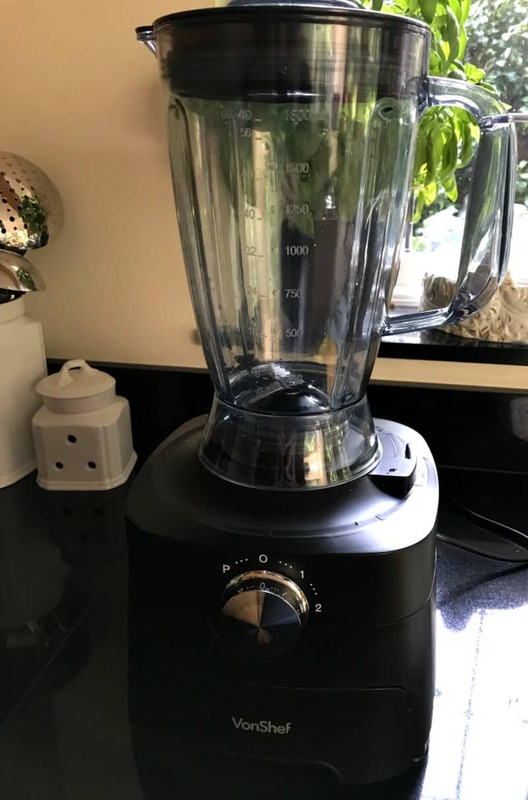 I found it very easy to fit the jug and food processor bowl onto the body of the food processor lock the lid in place, and the simple design means you can put this together without needing to read the entire instruction manual first. My only niggle would be that for left-handers like me it would be useful to have the measurements on both sides of the jugs. I’ve been using it to whizz up soups, smoothies, blend and puree fruit and vegetables and loads more. It is really versatile and a great tool to add to the kitchen to make all those jobs a bit easier. Functions I have yet to try are using it to make dough, and shred and grate vegetables. The food processor comes with special blades for medium and fine slicing, and medium and fine grating, shredding and kneading so those jobs will be much quicker to do once I’ve tried them out. It’s easy to get the food into the bowl as the chute is extra-large, and because it can be taken apart and the parts put in the dishwasher, cleaning up is easy too. You can get yourself a VonShef food processor from Domu. Disclosure: This product was gifted to me for the purposes of a review. No other compensation was received. All views are my own. On another blog I saw the processor being used to make nut butter. Me want! I’ll have to try that, great news if I can make that at home now!! What a great bit of kit! Its so much neater and tidier than my old food processor. Love the drawer for all the blades! It is great to have all the bits right there where you need them!